This is what healthy heaven looks like before you blend it. Following on from Sash over at her gorgeous blog, Inked in Colour, I tried my first ever green smoothie several weeks ago; not counting the occasional Spirulina drink I used to slurp during my high school days. 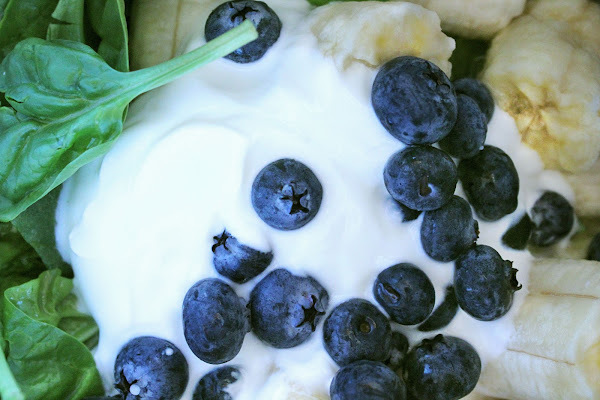 Place all ingredients into your blender and pulse, pulse, pulse until you have a thick, green smoothie, dotted with tiny indigo pieces of blueberries. A handy tip is to freeze your bananas because they really make the best smoothies. We're lucky we live in a beautiful region that is famous for them, they're usually quite cheap so we buy bunches and bunches of the curved yellow fruit and freeze them for times like these. 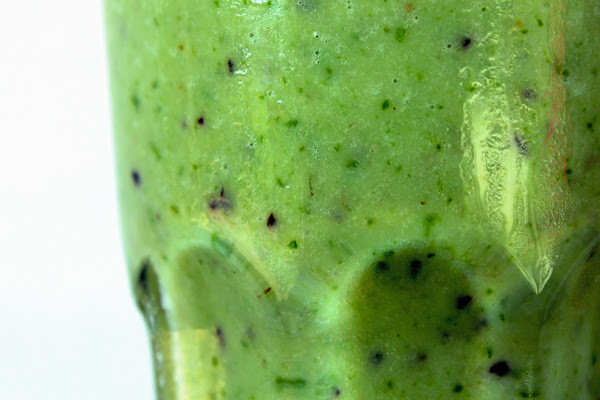 I've enjoyed a different style of green smoothie every day for the past couple of weeks. There's no end to the fruit and vegetable combinations. Add more bananas or mangoes for a sweeter taste, figs work well too and a squeeze of fresh lime will give it that extra kick that will make you want to do cartwheels on the sandy shores of a windy beach. Living green. It's just another reason to smile everyday. YUM! Miss Bella I will be trying this one tomorrow with my little beans! Thank you so much for sharing! Yum, that has me licking my lips and what a gorgeous colour! I've got most of the ingredients in the garden, fridge and freezer so I'll give that a try today. Mmm, that sounds delicious! I haven't had a smoothie in a while. I think I might have to make one of these.